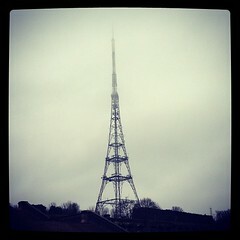 As I write this post it is one week since I set off from Crystal Palace to Paris on my bicycle. 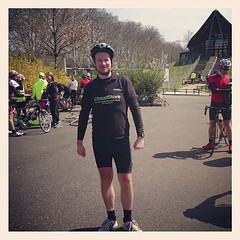 The ride was for charity and I supported Marie Curie Cancer care. If you are interested you can still donate using my Just Giving page. Here is a write up of the trip. We all arrived at Crystal Palace sports centre between 0545 and 0630 on Wednesday 17th April. There were about 140 keen cyclists all of whom had been preparing for the ride for several months. I was a little worried that I had not done enough preparation. I was able to do 30 minutes on an exercise bike in the gym on most days and go on a long ride at the weekends when I was in London. Each day except the last was broken into 4 legs with breaks at a water-stop in the morning, lunch and a water-stop in the afternoon. The last day was broken into 2 legs with a further convoy into Paris. We set off around 0700 and I begun the journey with a gentleman called Paul. Ironically the ride took me back past my house. Paul and I got separated when we hit our first major hill. Quite simply I could not get up the hill as fast as him and it was at this point that I felt that I had not done enough preparation. Still I made it to the water-stop after about 28 miles. I had an energy bar, water and some isotonic drink before heading off about 20 minutes later. The water-stop was well stocked. There were more hills before lunch. There was also a lot of mist and rain. During this leg, I got talking to a few riders who were overtaking me. There was a good sense of camaraderie and I had several conversations with others as we rode along the road. Lunch was cold meats, bread, salads and a hot pasta dish. In the afternoon, I begun to get tired and I was riding with a guy called Jonathan who refused to abandon me on the harder sections. 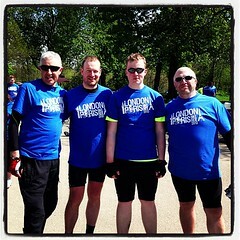 We ended up keeping together after the water-stop and rode into Dover together. The run into Dover was the easiest with a large stretch downhill. After an hour and a half wait, we were convoyed to the ferry port and travelled to Calais. I took dinner on my own in the brasserie on the ferry having a well deserved smoked salmon starter and steak and chips. On arrival in Calais we were convoyed to the hotel. I was very tired. I waited for my room mate to arrive but he had paired up with someone else. The good result of this was that for the entire trip I had a room to myself, which meant I would get a good rest every evening. Some did not make the ferry but made the next one. I foam rolled my legs and put on some deep heat as a precaution before getting to sleep around midnight. After a continental breakfast, we had to ride to the other hotel to pick up the others. The sun was deceiving – I set off in my under-armour and cycle top, only to have to put on my cycling coat 1 minute down the road. The wind was very annoying with head winds between 25 and 30mph. It was impossible to get any speed up. The first leg of the journey took me three and half hours due to the wind. I was one of the first to leave but one of the last to get to the water-stop. In addition to the wind, the first leg had a lot of uphill runs that I was not particularly prepared for. Because of the length of the ride, by the time I got to the water-stop it was midday. I ended up having four energy bars and a banana before moving on. The second ride was better but the wind was still a problem. After lunch, things became significantly easier. I had dinner at the hotel in Abbeville with some of the other riders and I was in bed by 2130. I slept through to 0700. This was a much better day. The wind had died down and it was sunny. There were hills but not as severe as the previous days. This was what I signed up for. I was at the back of the group for most of the day but it was a good enjoyable ride through beautiful French countryside. I was able to take it in because the ride was not a fight like on day 2. We had some urban riding as we arrived in Beauvais and this was our destination for the day. In the evening, lots of the riders hit the beer. At this point, I had been teetotal for almost 4 weeks and was intending to continue until the end of the ride. I left early and was the third to get to the water-stop. All the fast riders were having an extra rest because at an average speed of 25mph they can easily catch up. I also got to lunch early and had to wait an hour before we were allowed to continue. 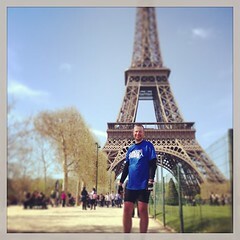 The last leg was a convoy through Paris to the Eiffel Tower which felt great. On arrival we were greeted by friends and family of some of the riders and we were each given a glass of champagne. After pictures were taken, we all headed to the hotel separately. This was a nice urban ride, albeit through some very heavy Paris traffic. I finished the ride by foam rolling, stretching and getting the bulk of my packing done before having a litre of water and then starting on the beer. Skyline did a great job of preparing lunches that provide the right sort of calories for a good bicycle ride. The water-stops were also stocked full of energy bars. The only refreshments that I had to take along was isotonic drinks. Skyline also look after the walking wounded. They were fixing people up and looking after riders who had given up. A couple of riders finished the ride in one of the vans which became known as the “love bus”. My bike was not really right for the ride. I have a hybrid with mountain bike tires. If I ever do a ride like this again, I will get a road bike or change the tires on my bike. My speed suffered due to the friction of the tires on the road. In terms of injuries and health I had a lot of luck. I applied Deep Heat twice throughout the trip and foam rolled my legs at the end of each day. As a result I had no problems. The roller gets rid of the tightness and knots in the muscles. I had packed painkillers and knee supports but I did not need to use them. The Deep Heat was really precautionary too. Others were not so lucky – there were some injuries on the first day and from what I could see, these were not due to lack of preparation. I had no problems with chaffing because I used vaseline on my body and cycling shorts from day one. Other riders were applying lots of layers of vaseline or chamois cream – I just needed to do this at the start of the day. If I was doing the ride again, I would have also applied vaseline to my lips because they were chapped by the end of the trip. Also I completely forgot (probably due to the recent weather conditions) the risk of sunburn, so I have two burnt knees and a tanned head. If you are thinking of doing this ride, I would get the mileage in but concentrate on hill work. If the worse comes to the worst you can always walk up the hill. On a couple of long uphill stretches, I did this and I was not the only one to do so. The main thing is to have fun and once you break the back of the ride it becomes very easy to do so. On the day after the last day of the ride, I went to the Eiffel Tower and fulfilled a promise – I tied the мартеница (Martenitsa) that I was given on the 1st March to the tower. Rob also has a write up on his blog. Posted in Charity, Fitness, Travel and PlacesBookmark the permalink.